Introduced back in May, HTC’s 4.3-inch Sensation flagship smartphone will soon be available in an upgraded version, in the form of the Sensation XE. 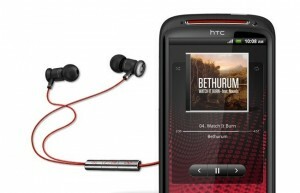 It comes as the first product from HTC to be manufactured in partnership with Beats Electronics. Featuring Beats Audio technology and a remote-equipped pair of Beats by Dr. Dre earphones, the Sensation XE packs a faster dual-core 1.5GHz CPU and a higher capacity 1730 mAh battery. After the Beats by Dr. Dre in-ear headphones are connected, the phone automatically detects the Beats headset in order to optimize the output and improve the audio experience. The remote control allows users to pause, play or skip through tracks and answer/end calls without reaching for the phone. The Sensation XE is also bundled with an 8GB or 16GB micro SD card and features an aluminum unibody housing with details in red and a Beats Audio logo on the back. Part of the phone’s specs come unchanged in comparison to the standard version. Those include a 4.3-inch nHD S-LCD display, 8 megapixel rear facing the camera with autofocus, dual-LED flash and full HD video recording, VGA front-facing the camera, 768MB of RAM, 3G support with up to 14.4 Mbps download speed available, DLNA support, as well as Android 2.3 Gingerbread with HTC Sense UI. Given its larger battery, the Sensation XE is slightly heavier, weighing in at 151 grams (5.33 ounces) while measuring 126.1 x 65.4 x 11.3 mm (4.96 x 2.57 x 0.44 in). The HTC Sensation XE is slated for release in late September, with no official worldwide pricing revealed, while it is rumored to be priced at GBP492 (US$775) in the UK.